There are several trends and products which are really making an impact for 2019. Trend or fad? we will have to wait and see but here are a few that caught our eye. 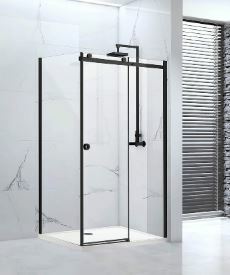 The trend has been slow to develop but it appears the black tap, radiator and shower enclosure trend is finally getting some traction. 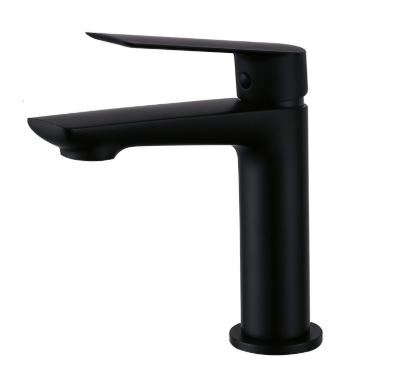 At Addingtons we have a matt black tap on display from our Eden range. We had steered away from the matt black market, in much the same as we did the rose gold trend. The trend only works if you can ensure every item is then matt black, from the sink waste, shower waste, shower, accessories however now these aspects have been possible and we feel it is now a viable competitor to the traditional chrome. The traditional standard flush plate is made of plastic and coated in a chrome look to keep it in line with the other products but clients are wanting more than this for there flush button, they want something more sleek, more design led but without it breaking the bank. Our chosen supplier for this is Frontline who offer not only clear glass but black and frosted glass as well. 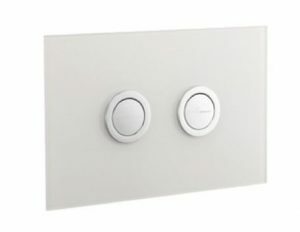 Previously these were mostly available for wall mounted cisterns but now Frontline are offering a version made specifically to go into a furniture unit opening up more design ideas and options. Bluetooth – in a mirror? There are sometimes products that come into the market that you didn’t realise you needed and a bluetooth mirror is one of them. Our supplier offers the bluetooth option almost as standard now with many of there mirrors. 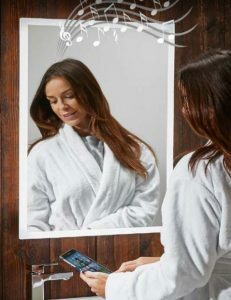 You simply connect your phone up to the mirror and your music can play through the crystal clear speakers whilst you’re singing along in the shower. 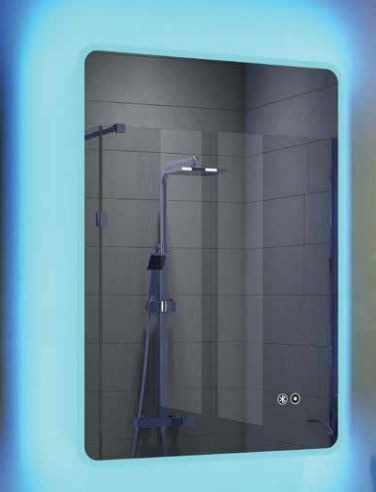 Twin this with demist functions and ambient lighting and you find a stylish and functional mirror that can become the star of your bathroom. 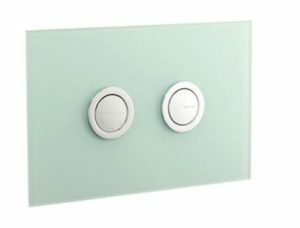 At our showroom we can offer and show you these products, we are able to supply only or supply and installation. Contact us today or come into our showroom.